As I already stated a couple of times, The Basicks company is selling lots of accessories for wargames’ fans, and my favorite are their battle bases. 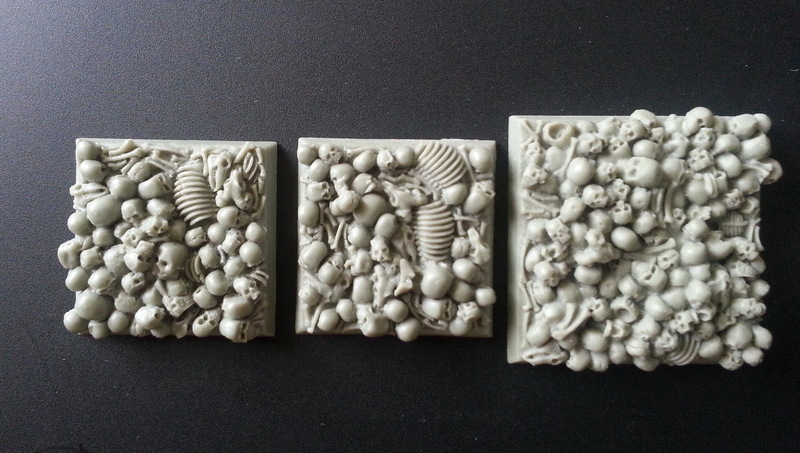 Today I wanted to present some of the fairly recent ones, a Boneyard set. 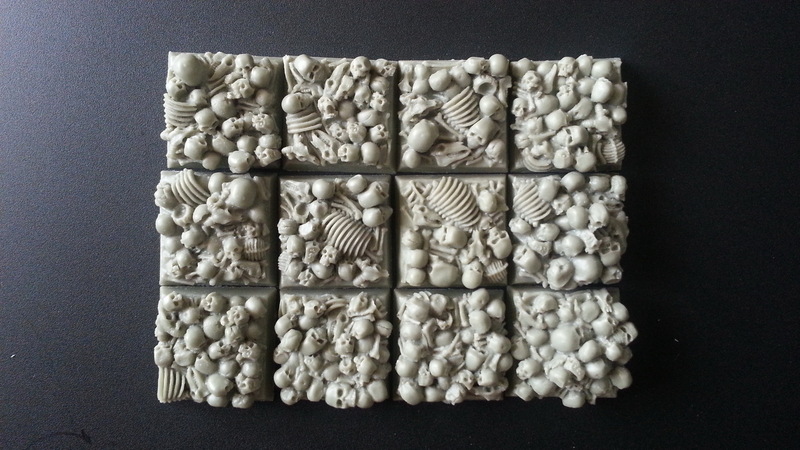 I've seen many morbid designs for miniatures and miniature bases, but none had so many… bones. The set’s name – Boneyard - is very adequate. Their designs are equally fascinating and dreadful, which make them really interesting. 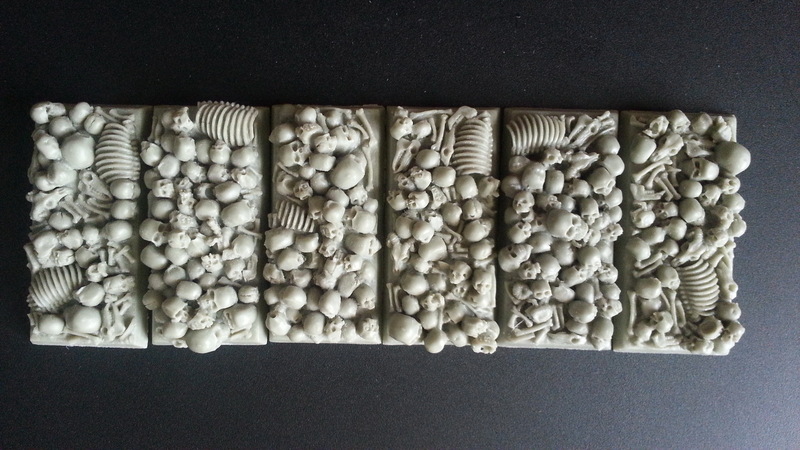 If you are painting an army of Undead, Tomb Kings, Vampire Counts or Chaos, those battle bases are ideal for you. It’s like you are watching your own Army of Darkness movie. The Basicks company has provided me with an almost whole set from Boneyard series, so I had a good look. 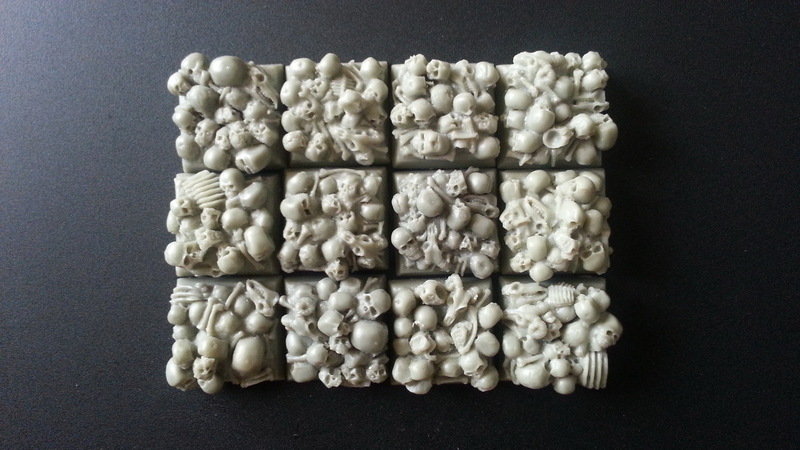 There are six different designs with a diameter of 20x20 mm, 25x25 mm (for basic units), 50x50 mm, 40x40 mm (best suited for larger models - heroes and monsters), 25x50 mm (for cavalry) and finally 50x100 millimeters (for example - for chariots or catapults). All those bases are great, but the larger ones can be easily changed into dioramas. All the bases are quite similar. Still, that’s not a flaw, that’s just the main theme. Almost every millimeter of each base is covered with bones, skulls, and ribcages, all together mashed into the earth so hard and in such quantities, that the bones have become the new ground. Models that use such terrain as a base can be quite intimidating. All those accessories are made with high quality grey resin. Details as always are sharp and clean, even with such massive number of details: every bone and every skull is made with great attention, and every bone is perfectly visible among others. It is not a surprise, because the high level of detail, as I have found out, is characteristic to all Basicks products. It rarely happens that small errors are visible, such as small air holes in resin, or a skull eye socket not wholly empty (slight miscasts). You must also remember that it is not flat surface, so you must sometimes use greenstuff to properly adjust your miniature. All of these drawbacks, however, are relatively small and can be easily repaired or wholly ignored. All you have to remember is that the Boneyard set bases are nice designs and can be used successfully, either for whole regiments or for a stand-alone hero (or even for a whole army if you have enough money). Those items were provided by Basicks company for the purpose of reviewed on Sthenno web site!